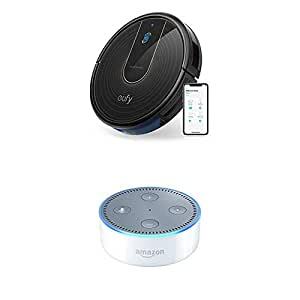 This bundle contains the white Echo Dot (2nd Generation) and the eufy RoboVac 15C robotic vacuum. The Echo (2nd Generation) has seven microphones, beamforming technology, and noise cancellation, and can hear you from any directionâeven while music is playing. The Echo (2nd Generation) has a new speaker, now with Dolby processing for crisp vocals and dynamic bass response. Echo can fill the room with 360Â° omnidirectional audio.